When it comes to providing you and your family with quality dental care in a friendly and warm environment, Ria Family Dental has the team to trust. From simple to complicated dental needs, the Ria Family Dental team has you covered. At Ria Family Dental, your smile is our number one priority. At Ria Family Dental you will experience quality dental care for you and your family. Talk to us today! A wisdom tooth extraction is a common dental procedure. An extraction is performed so that the wisdom tooth will not compromise your oral health. A wisdom tooth may have the following issues leading to their removal: impaction, cysts, and gum flaps among others. A root canal treatment stops the infection from worsening by removing the pulp, cleaning the inside of the tooth, and replacing it with a filling. The success rate for a root canal treatment is high. About 90 to 95 percent of patients who undergo the procedure have a fully functional tooth after the treatment. Coupled with good oral hygiene and proper care, the treated tooth can last a very long time. Your tooth enamel is the hardest substance in the body. Yet despite the hard nature of their exteriors, the teeth can be damaged. No matter how much we want them to stay strong, healthy, and complete for a lifetime, sometimes there are situations requiring extraction. We believe in exhausting all possible solutions to save your tooth. However in the cases an extraction is needed, we assure you that our tooth extraction is completely safe. A healthy jawbone is a critical element of good oral health. Its health is just as important as that of the teeth for overall comfort and efficiency. Just like the teeth, your jawbone can suffer from diseases. Once your jawbone is affllicted, your teeth, oral health, and general wellbeing are affected. Tooth decay is a common dental issue and is the leading cause of tooth loss. It plagues the young and old alike and results in other dental problems when left untreated. At Ria Family Dental, we take great pride in our preventive dentistry services and encourage our patients to embrace them for a risk-free mouth. For patients who already have tooth decay, we offer comprehensive dental treatments to stop the decay from worsening. Halitosis, more commonly known as bad breath, is a common dental issue and is one of the most upsetting kind. Add to that the fact that sufferers cannot tell if they have it or not. Our nose is numbed to our own breath. Without a dentist’s help, sufferers can only depend on the honesty of their loved ones to become aware of their condition. To treat bad breath, Ria Family Dental can help! If you or someone you know has bad breath, see us right away. Ria Family Dental can restore fresher breath through comprehensive dental treatments. Gum disease is the second leading cause of tooth loss. Hence, healthy gums mean decreased risk of losing your teeth. At Ria Family Dental, we provide comprehensive services to keep your gums pink and healthy. Talk to your trusted Ria Family Dental dentist today! Dental anxiety is a common condition affecting about 5% of the Australian population. This is one of the top reasons why people miss dental appointments. At Ria Family Dental, we help our patients with dental anxiety relax and even enjoy their dental visit through our sedation techniques. Having the right dentist plays a big role in achieving optimal oral health. At Ria Family Dental, we make sure to always meet and even exceed your expectations. Everyday, we create more and more reason for you to smile and choose us. Trust your oral health no one else. 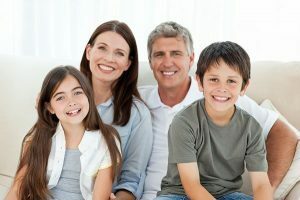 At Ria Family Dental, your and your family’s smiles are our number one priority.